Whats the aim of the Canyoning Activity? To decend a mountain stream or mountain gorge using ropes and harnessess where needed. You will be required to jump and slide into deep plunge pools, sometimes from heights of up to aprox 5 metres. What does the activity include? The activity includes all specialist equipment, instruction, and waterproof clothing and wetsuits. Where does the experience take place? We have venues mainly in The Lake District, Cumbria. We supply a wetsuit and jacket but on top wear something warm like a fleece, preferably something old and loose fitting. Footwear should ideally be boots or shoes with a grip, but trainers with grip will do as a last resort. How long should I allow for this experience? Our sessions last for 3 hours from start to finish including setting up and derigging time. When does the activity take place? We are available 7 days a week for canyoning, mainly March to September but if the weather is suitable we can work outside of these months. There are no real restrictions, for individuals with disabilities we will discuss the options available and extra staffing can be made available if required. The weather would need to be really bad to stop our sessions; if it turns bad on the day we would try to have an alternative activity on hand. 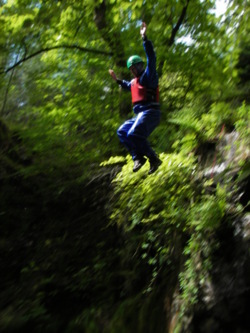 Canyoning is not a spectator sport as it takes place mainly in a deep gorge.